NEW ORLEANS — Scholar Team of the Year and All-Academic Team honors for the 2015-16 NCAA Division III Track & Field seasons were announced Thursday by the U.S. Track & Field and Cross Country Coaches Association (USTFCCCA). 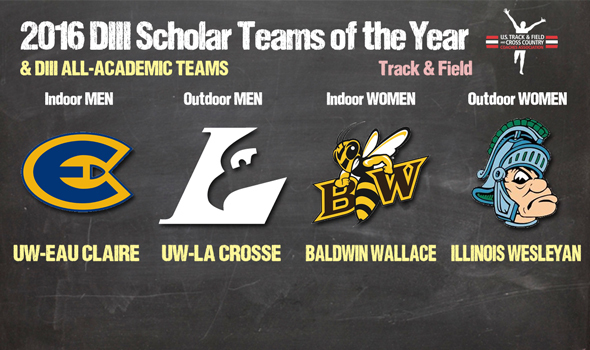 The UW-Eau Claire men and Baldwin Wallace women, both national champions, were honored as Indoor Scholar Teams of the Year. That trend continued during the outdoor season as the national champion UW-La Crosse men and Illinois Wesleyan women took home the laurels for Outdoor Scholar Teams of the Year. In order to be in the running for Scholar Team of the Year, a team must finish highly at the respective national championship and have at least a 3.10 cumulative team GPA. All told, there were 112 men’s teams and 175 women’s teams up for consideration. At the NCAA Division III Indoor Championships in Grinnell, Iowa, the Blugolds and Yellow Jackets waged remarkable comebacks to win their respective national titles. UW-Eau Claire was led Josh Thorson, the Male Indoor Track Scholar Athlete of the Year, while Baldwin Wallace was carried by Melanie Winters, the Female Indoor Field Scholar Athlete of the Year. This is the second Indoor Scholar Team of the Year Award for the Blugolds (third overall, but first since 2012), while it’s the Yellow Jackets’ first in program history. There was little denying UW-La Crosse and Illinois Wesleyan at the NCAA Division III Outdoor Championships in Waverly, Iowa. The Eagles beat UW-Eau Claire by eight points (41-33) and ended the rival’s chance at a Triple Crown (XC, Indoor & Outdoor titles in the same academic year), while the Titans edged Baldwin Wallace by one point (42-41) thanks to the efforts of Amelia Glueck, the Female Outdoor Field Scholar Athlete of the Year. Counting this one, the past four Men’s Outdoor Scholar Team of the Year honors went to UW-La Crosse. This is Illinois Wesleyan’s first since 2010, but the Titans also swept the slate clean in 2008, winning both the Indoor and Outdoor Scholar Teams of the Year honors. In total, there were 112 men’s teams and 175 women’s teams honored by the Association for success in the classroom and in competition. Fontbonne’s women had the best GPA out of every DIII team with a 3.84. The runner-up women’s team was St. John Fisher at 3.645, followed by third-place tie between Carleton College and Whitworth at 3.63. Edgewood College rounded out the top-5 with its GPA of 3.62. The top men’s team was Waynesburg University with a GPA of 3.7. Principia College followed at 3.599, narrowly topping MIT withi ts 3.5968. The fourth-place men’s team was Carleton College at 3.55 and fifth place belonged to Stevens at 3.524. See below for a full list of those teams named All-Academic by the USTFCCCA.